GR Scott Budinger, MD, associate professor in Medicine-Pulmonary and Cell and Molecular Biology, was recently elected into the American Society for Clinical Investigation (ASCI). He joins the more than 3,000 physician-scientists honored with membership in the association. “The ASCI includes some of the most prominent and successful physician-scientists in medicine. Many of the people who have mentored me and whom I emulate are active members in the ASCI, so it is a true honor to be included in their ranks,” Dr. Budinger said. Dr. Budinger’s laboratory studies how exposure to air pollution activates signaling pathways in the lungs that might contribute to the development of acute lung injury and fibrosis. His research has been continuously funded by the National Institutes of Health since 2001. While studying the development of lung injury, Dr. Budinger was the first to link cell structure dysfunction with epithelial repair and fibrosis. His group also discovered that a drug used widely for the treatment of cancer is effective in preventing lung fibrosis in mice. Working with Navdeep Chandel, PhD, professor in Medicine-Pulmonary and Cell and Molecular Biology, and Gokhan M. Mutlu, MD, professor of Medicine and chief of Pulmonary and Critical Care Medicine at the University of Chicago, Dr. Budinger recently reported that oxidative stress plays a critical signaling role in accelerating cancer progression. Dr. Budinger earned his undergraduate degree from Northwestern University and his medical degree at the University of Illinois. He completed his residency in internal medicine and fellowship in pulmonary and critical care at the University of Chicago Hospitals. 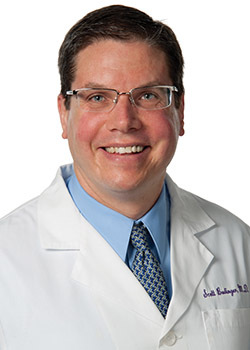 He worked at Northwestern University Feinberg School of Medicine as an assistant professor of Pulmonary and Critical Care Medicine from 1997 to 1998, and then returned in 2000. Dr. Budinger has served for the past three years as a deputy editor for the American Journal of Respiratory and Critical Care Medicine and is on the editorial board of the American Journal of Respiratory Cell and Molecular Biology. He is also a member of the Alpha Omega Alpha medical honor society and has received the Department of Medicine Outstanding Teaching Award. Established in 1908, the ASCI is one of the nation’s oldest and most respected medical honor societies. The ASCI includes more than 3,000 physician-scientists from all medical specialties, and publishes the Journal of Clinical Investigation. Members are elected based on their outstanding record of scholarly achievement in biomedical research.